If you haven’t heard of the famous iLuminate Dance group before, chances are in Samoa this week, you will now be very well aware of them. The group made a name for themselves after appearing on America’s Got Talent 2011 show and they have been doing international performances ever since. By brilliantly fusing technology and dance, the group has performed jaw-dropping shows all over the world and now they are here sharing the magic with Samoa. They are famous for using coded light suits during their dances to show a beautiful series of flashing lights to every beat of a song. After visiting schools around Samoa for small workshops, they held a small show on Tuesday night at the U.S. Embassy residence in Vailima along with performances by Samoa’s best dance crew ‘Unknown’ from Vaimoso as well as the U.S.P dance theatre group. But how did iLuminate start? “How we started is actually a really cool story, our boss Miral Kotb was the one who came up with the whole idea, she actually used to be a dancer but she got hurt,” iLuminate dancer, Lisa Bauford (a.k.a. L-Boogie) told the Samoa Observer. “She has this amazing mind and she is just brilliant, she wanted to find a way to fuse both of her gifts; her gifts of dance as well as technology and science. But why have they chosen a small island like Samoa to perform their magic? “We get this question a lot and the only thing that comes to mind is ‘why not?’,” Ms. Bauford said. “We had an opportunity to come here and perform for Samoa and I think what is special for me and the others on my team is that we all grew up in a rough environment. “We grew up in poverty stricken areas which are some of the areas we have been performing at. Just being able to go to these places and show the kids that we come from similar backgrounds and we are able to do something that we love and travel the world is great. “We try and show everyone that it’s possible to achieve dreams. Us wanting to help through dance is something important and has been resonating within us. Similar to the rest of the team, Ms. Bauford had a rough upbringing but decided not to let it rip her life apart. “My family personally didn’t have a lot of money growing up and we had to live off of the state and my mom was a single mom for a while raising three kids,” she said. “It was really hard for us financially to do a lot of things so I looked to basketball which I played my whole life and it gave me a scholarship to go to school. “My mom raised us really well but we didn’t have a lot growing up and a lot of the places we lived in had a lot of drugs, violence and everything you can think off. “But we were able to not allow that to dictate where we were going, those negative things surrounded us but that wasn’t where we were going to stay. But how is all this light magic done? “The magic happens through the coding that Miral, Bob and Jordan do, they sync all the light cues to the suits,” Ms. Bauford said. “So basically the choreographer creates the moves, and we sit with the technician and pretty much do everything on count. 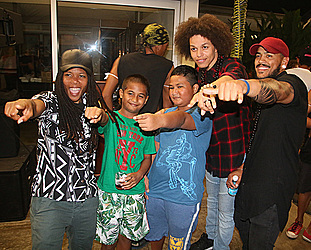 The team had a great time in Samoa and they wish to return in the near future. “Bring us back,” Ms. Bauford said. “Before we go back I want to leave a message for the kids of Samoa, Everything is possible. “Just stay passionate about what you want to do, and if you know what you want and you have a passion for it then keep going for it. For the U.S. Embassy’s Charge D’Affaires, Angelina Wilkinson, she was ecstatic about the dance group’s presence. “We had a fantastic time tonight with the iLuminate group,” she said. “They came all the way from Los Angeles, New York, Atlanta, Chicago and around America. “We are so excited that they were here with us, we have over 200 people here tonight and the dancers did an amazing job. “The three numbers they did were great and one of the best things they did was knowing their audience; we had a great number from the 80’s and a Michael Jackson montage we were rocking to. Mrs. Wilkinson and her team made the most of the dance groups visit by setting up different workshops for schools all around Samoa. “To be able to bring that sort of thing to Samoa has been great,” she said. “For the last two days we have been running around visiting a lot of the schools and we are capping everything off tonight here at the U.S. Residence. As for dance professional Seuili Allan Alo, having the team here is something we can all benefit from. “The dance group is at that professional level who travels around the world to promote hip hop and with their illuminate dancing suits,” he said. “Their presence in Samoa is something good especially as we move into technology; it is also great that they promote something that young people could use to vent out their frustrations. “With all the depression and suppression that is happening in our society, you look at so many kids fighting unnecessarily; this is because there is no platform other than athletics.